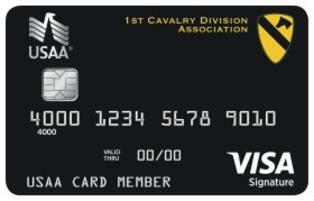 The 1st Cavalry Division Association USAA Visa Signature® credit card is now available to members of the 1st Cavalry Division Association. 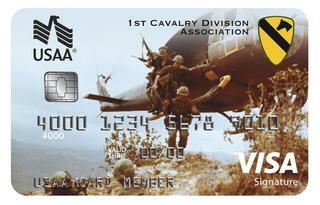 USAA Bank is the exclusive provider of credit card services for the 1st Cavalry Division Association. Show your support for the 1st Cavalry Division Association each time you use your 1st Cavalry Division Association USAA Rewards credit card. USAA Bank will make a contribution to the 1st Cavalry Division Association for every credit card account opened and each time you make an eligible purchase with the card. This card benefits the Association, its scholarship program and the 1st Cavalry Division Museum Foundation. Choose from two card designs created exclusively for the 1st Cavalry Division Association. Founded in 1922 by military officers, USAA continues to focus on serving military members, Veterans who have received a discharge type of Honorable and their eligible Family members. You may be eligible to enjoy USAA’s financial products and fine customer service. For more information about USAA you may call 877-917-1232 or visit www.usaa.com/1cdacc. Click on the button below to go to a USAA secure server and sign up. The Board of Governors of the 1st Cavalry Division Association has selected USAA as the exclusive provider of Financial Services for the 1st Cavalry Division Association and its members. While it is voluntary for you to become a member of USAA and sign up for their services the Board endorses the products of USAA and the USAA organization as a entity. You get access to competitive products, award-winning customer service and the convenience of banking, savings and insurance when and where you want. Best of all, USAA is free to join and you can pass the benefits of membership to your children. Click on the button below to go to a USAA secure server and learn more about their financial and insurance programs.